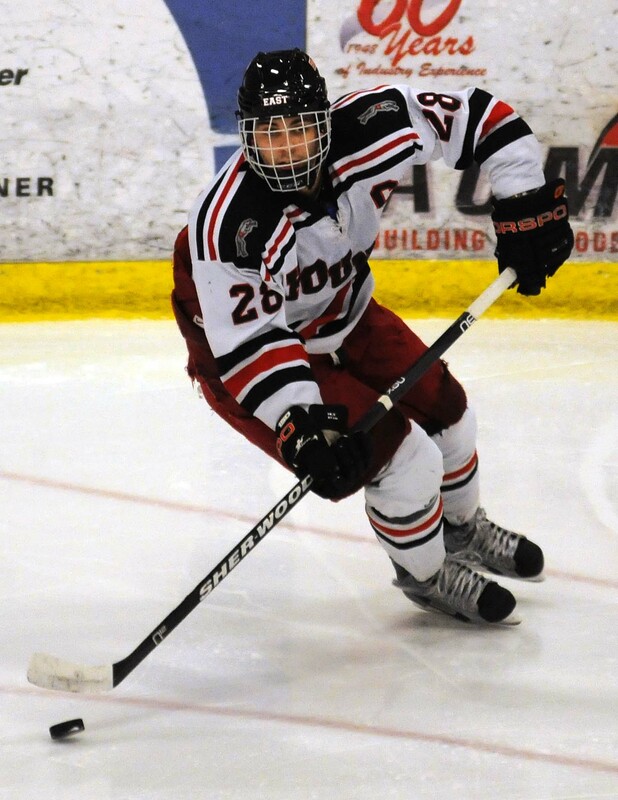 Starting the year with tons of expectations – both for his team and for himself – Duluth East senior Nate Repensky didn’t feel that he was playing up to his potential in the early going. His personal struggles weren’t because he had slacked in the offseason or lost his game. Instead, Repensky didn’t feel he was playing up to par because he was battling back from wrist surgery to fix a torn ligament. “Coming off surgery and trying to play in the Elite League not healthy and knowing you should be playing better… it’s definitely not fun,” Repensky said. To makes things more complicated, Repensky woke up on the eve of the Schwan Cup tournament with a sore, swollen arm after playing in Duluth East’s first eight games. Repensky had an infection, forcing him to watch from the stands as his Duluth East teammates played in the holiday tournament. Although he was happy that the Greyhounds won the Schwan Cup and played well with him out, Repensky obviously wanted to be on the ice. “It’s never fun to sit out, and it’s never fun to play below what you think you can. But, at the same time, the team kept playing well, so it’s nice to see the guys win, that’s for sure,” said Repensky. After the Christmas break, Repensky was cleared to skate with the team in practice, but was still limited in his puck handling because of a cast on his arm – he’s only recently commenced wrist-strengthening exercises. Admittedly, Repensky was a little nervous when he was finally ready to return to the lineup against Minnetonka on Hockey Day Minnesota. But, like the seasoned veteran he is, Repensky was able to adapt. Both Repensky and Duluth East head coach Mike Randolph can sense that he’s getting better with every shift, which was evident in his play on Saturday, Feb. 4, against Blaine. Repensky scored a goal and added an assist against the Bengals, but flashed some quick dangles and strong passing throughout the contest. He was solid on the defensive side of the puck, too. Even so, Repensky believes he still has work ahead of him. Randolph is certain that won’t take long. Senior defensman Nate Repensky skates up the ice during the third period. Seven different players scored and 16 different players had at least a point as the top-ranked Duluth East Greyhounds ran away with a 9-1 win over visiting Blaine on Saturday, Feb. 4, at the Heritage Sports Center in Duluth. The Hounds came out flying in the opening period, outshooting the Bengals 11-2 while building a 2-0 lead before the intermission. Alex Toscano opened the scoring with a tap-in from the right side of the crease off a feed from Trevor Olson. Sophomore blue-liner Phil Beaulieu started the play with a tape-to-tape bullet to spring Olson. Hogan Davidson slapped a puck over Blaine goalie Nick Malvin’s glove just a couple minutes later to give Duluth East the 2-0 lead after 17 minutes. The Bengals used the intermission to find their legs, and quickly cut the lead in half on a Jesse Norling breakaway tally 2 minutes, 38 seconds after the period began. But, the Hounds continued to battle, pressured the Blaine net and eventually broke through for a pair of late goals to take a 4-1 advantage into the final frame. Five third-period goals – including three on a late five-minute major – made the final score look a lot more lopsided than the game actually was. Toscano and Dom Toninato scored twice for the Hounds; Meirs Moore, Steven Holappa, Nate Repensky and Kyle Campion all recorded single markers for Duluth East (20-1-0). Dylan Parker was solid in net for the Hounds, stopping 19 shots for the win. Malvin was replaced by James Simmer after the sixth Duluth East goal, but still finished with 17 saves. Simmer turned away eight shots in relief. Blaine (12-8-0) will look to bounce back from the loss when they travel to Moorhead to take on the Spuds on Tuesday night. Duluth East will take the ice on Monday night at Amsoil Arena, where it will battle will bitter rival Cloquet/Esko/Carlton. The senior blue-liner missed several games midway through the year, but you sure wouldn’t know it by watching him play. Repensky’s decision making is suburb, and he proved that with precision passes and rock-solid defensive stops on Saturday afternoon. Repensky finished with a goal and two points on the night, was physical when he needed to be and helped the Hounds control all three zones. Toscano scored the game’s first goal, added another tally late and finished with three points. He’s a big, strong forward, making it difficult to defend him in front of the net and along the walls. On Saturday, Toscano muscled his way to the net, created traffic in front and played a gritty wall game to help Duluth East in all situations. Randolph may not have scored a goal, but he was the biggest reason for a pair of Duluth East tallies on Saturday. He finished with two assists, setting up Dom Toninato for both of his goals. Randolph may get a lot of recognition for his goal scoring, but he’s able to toss pucks around like frisbees with incredible accuracy.